Do you have a tough line of work that demands sturdy, yet comfortable work boots? Do you hate the hassle that comes with tying laces, but you’re afraid you’ll lose some of the comfort they offer? Well, with the best pull-on work boots, you won’t have to sacrifice a good fit for speed, comfort or protection. These boots slip in fast and minimize foot fatigue. 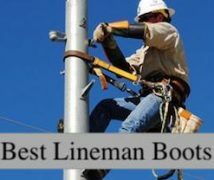 But mostly, they have the same characteristics of regular, lace-tied work boots, which rely on specific features like materials, craftsmanship, and type of toe reinforcement. Still, you want the best in the market, right? Well, then you need to assess all these specific features in terms of your purpose, which is what we’ll try to help you with below. After our short, introductory buying guide, we’ll leave you in the great company of 10 awesome pull-on work boots so you can compare, contrast and/or choose from. As we’ve said before, pull on boots are just like lace-tied boots in every other regard except how you put them on and how you secure them. We’ll discuss all their main features below, taking into account their best use to help you choose the best pair for you. If you want a pair of slip-on boots, you might also be interested in how easy it actually is to pull them on and off. So when it comes to this, having some pull-on loops is great, it helps you keep the boot steady while you slip your foot inside. But these loops have to be resistant enough so they won’t rip with repeated use. You should also make sure they’re wide enough so you can actually place your index fingers through them. It’s obvious that work boots, as well as 100% of footwear, must be bought in the right size to ensure a comfortable fit. Still, things might be a bit tricky with pull-on boots, since you want a shaft that’s large enough to slip your foot inside, though tight enough not to feel awkward while walking. The problem can be at least partly solved with ankle-high boots, but the key lies in the material. So choose a pair of boots that are flexible, or with side elastic fabric on the upper, to make sure they get back to their original size once your feet are snuggled inside. 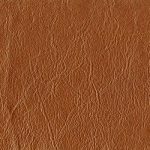 Hands-down the best upper material used for pull-on boots is leather because it offers the perfect mix of rigidity and elasticity that we mentioned in the section above. It’s also resistant to water, punctures, abrasions and it offers perfect insulation. The rubber or polyurethane outsoles provide top-notch traction, though PU outsoles might be lighter, and it doesn’t hurt to look out for a lug design if you want increased grip. You will also appreciate very soft, EVA midsoles and cushioned insoles, but all these are better for colder weather. Even if there’s a breathable mesh or a waterproof lining of sorts to wick some of that moisture, very cushiony materials still add to the overall weight and warmth. In terms of support, look for steel, composite or wood shanks. We’ve listed these in decreasing order of their rigidity, but steel is also the heaviest. So make sure you choose according to your purpose: the increased support offered by steel might come at the price of some extra foot fatigue associated with long hours walking. The materials used will only take you halfway to a perfect boot; you also need to take craftsmanship into account. For instance, the cement construction is great for less aggressive work environments, because it’s not that resistant, although it’s great for rubber soles. Blake welting is more resistant, it’s also flexible and pretty affordable, though a Goodyear welt is the most durable from the batch. With its two-level stitching and more layers between the insole and the outsole, the Goodyear welt is also the best for waterproofing purposes, though it’s not extremely flexible. The work boots toe reinforcement is a very important characteristic highly dependent on your work environment. Steel is hands-down the best if you want perfect protection against impacts and compression, though aluminum and alloy can do a pretty good job too, and they’re also lighter. However, these materials aren’t great against electrical hazards, unless they have the specific rating. Composite toes are the best for electrical hazards, and they’re also the most comfortable so far, with an obvious increase in toe box size, which makes them great for prolonged hours standing. Obviously, the soft toe reinforcement is the most comfortable here, though it offers minimum protection. We’ll analyze 10 pairs, talking about their specific features and how these might be of use to you, so you can choose the best pair according to your line of work. We’ll also talk about their cons too, so you have an objective view of each, making it easier to compare them. The Caterpillar Revolver are some of the best slip on work boots on the market if we’re to judge their construction and how they look. With their full-grain leather upper and mid-calf design, they provide an awesome support for your ankle, repleting with durability. However, it takes a few days for them to break-in. I love their steel toe and how protective that is against all sorts of impacts and compressions that can happen on a construction site. And their rubber soles can protect you against electrical hazards too, not to mention that they’re resistant to slips. Still, mud tends to stick on the heel area, which might prove a bit inconvenient. The Goodyear welt construction is another asset in terms of resistance, while the dual pull handles make it very easy for you to slip on this boots. On the other hand, the steel-toe design renders their toe box rather small, so you might have some issues with the fit. These awesome Wolverine Men’s Raider are definitely some of the most comfortable slip-on work boots considering they provide an increased support and extra cushioning. The Contour Welt is very flexible so it can really allow your feet to move naturally, while the polyurethane midsole is light as well as comfortable. The Raiders feature rubber soles too, but these are a bit slippery. I really like the wave mesh lining since it’s so breathable and light, making these boots odor-resistant too. The MultiShox footbeds are a dream in terms of cushioning, and so is the whole MultiShox Comfort System. Thanks to these, you won’t feel the force of your weight when you’re stepping because the soles have individual compression pads that absorb shocks. The leather upper is quite durable and protective too, though these boots are just ankle-high. Besides, they’re also a bit loose around the ankle area so they won’t provide stellar support, but they do look extremely stylish for business-casual wear. 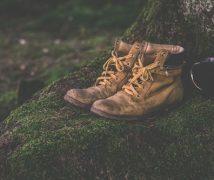 Still, make sure you give them some time to break in, especially because of their steel toe, albeit protective, might offer a tight fit at first. When it comes to the top-rated slip on work boots, the Men’s Icon certainly make justice to their name since they’re incredibly durable, as well as comfortable. That’s because they feature Air Wave midsoles for extra cushioning, while the insoles are themselves cushioned. Still, the Air Wave design isn’t that durable so you might need to eventually get some new orthopedic inserts. The PVC lug outsoles are great in terms of traction and grip, so you won’t slip even in muddy work conditions, not to mention that these boots are electrical hazard-resistant. Besides, the ANSI/ OSHA approved steel toe renders them really protective against all impacts and compressions, although it makes the toe box a bit small. I love the leather upper, it’s durable and easy to pull on, while the heat-sealed welt design is fairly resistant to most on-field conditions and inclement weather. But the thing I love most about these boots is their standard wood shank design which offers increased support for slippery conditions. The Georgia Men’s Giant Romeo is definitely a pair of awesome work boots, and the Giant in their name must refer to their 1.25-inch heel or their 0.5-inch platform, which are great for stepping on rubble or for walking on snow. That renders these shoes extremely versatile for different terrain conditions, though their short shaft can easily allow water or debris to get inside. Still, I love how protective these boots are. Apart from their steel toe, they also boast a toe bumper guard for increased protection, while the full-grain leather used for the upper is great against scratches or punctures. 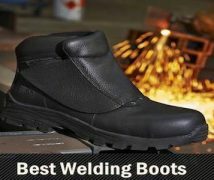 The steel shank offers great support, and I like the rubber sole for its oil and slip resistance. The Goodyear welt is another asset in terms of durability, and I’m head over heels about their thick sole cushioning. However, these boots also feel tight across the top, probably because of the steel toe design. If you’re after the best pull on work boots, these ones might be your dream come true. That’s because they boast a durable leather upper and a synthetic Endurance Arrowhead outsole that offers a stellar grip on muddy ground. Their aluminum toe is great in terms of protection, and these boots meet the ASTM F2413-11, M I/75 C/75, EH standards, meaning they’ll protect you against impacts, compression, and electrical hazards. Plus, they’re very light and have a wide 16-inch boot opening, so they’re very comfy for prolonged hours standing. On the other hand, these wide toe boxes might prove uncomfortable for some seeing as the boots might run a bit large. Still, you’ll love their cushiony polyurethane footbeds, which are very comfortable, as well as their supportive steel shank. With an 11.5-inch shaft and a direct-attach welt, these boots are the embodiment of resistance, not to mention they slip on really easily. On the other hand, you might notice these boots aren’t made for hot weather since they’re incredibly warm and insulating. With their waterproof design, the Timberland PRO Men’s AG fit among the best waterproof work boots so they can be used when the weather isn’t smiling at you. These are great for hunting, as well as for working on sites filled with puddles. Their alloy toe offers reliable protection, almost to the same degree to that of steel, although the difference is made by a wider, 15-inch boot opening. The full-grain leather uppers are resistant to punctures and impacts, and they have a cool decorative stitching that makes these boots really stylish. The synthetic sole and their durable Goodyear welt are markers of resistance, ensuring you can use these boots even in muddy, slippery conditions, although they have a cement design for the heel. Besides, the 11-inch shaft will provide increased support, while the tall heel and platform will minimize impacts to your soles. The Smart Comfort technology used is a Timberland signature mark, and it’s used for the medial shaft, to make it easier for you to slip these boots on. However, they might be more difficult to take them off, but that’s well worth the comfort of the fit. Bearing the Carhartt seal of trust, the Wellington boots are simply amazing, one of the best waterproof pull-on boots you can find in the middle price range. And also some of the most comfortable pull-on work boots we’ve found. With their composite toe and ASTM 2413-11 EH rating, these are amazing if you’re working in a place with tons of electrical hazards. I can’t decide what I like most about these boots, so I’ll start with the awesome craftsmanship consisting of a mix of leather and neoprene for the 10-inch shaft. The leather part is oil-tanned for increased weather and water-protection, while the neoprene offers terrific support. Besides, the stretch opening makes these boots really flexible and easy to pull on, though pretty difficult to pull off. The leather used for the upper is coated with polyurethane to offer protection against abrasions, and I can’t neglect the Strom Defender membrane that’s really breathable. That will prevent water from coming in but will let sweat get out, so you have dry feet no matter what. The insoles are very comfortable, made with a mix of Ortholite and polyurethane, with extra layers of polyurethane underneath it. The EVA midsoles are also incredibly cushioning, absorbing shocks to your feet, but these come with the disadvantage of unpleasant warmth during high temperatures. Still, the 14-inch boot opening is quite wide to accommodate even larger feet and help you walk comfortably for hours on end, while the rubber outsoles are great in terms of traction. Besides, while you can’t really wear these boots with thin socks because they’ll cause blisters, they’re perfect for cold, snowy weather and warm, thick socks. The Ariat Men’s are really great, with durable full-grain leather uppers and Duratread™ soles that render them waterproof. The leather used is also resistant to punctures and abrasion, while the sole is perfect when it comes to traction, so you can use it on very tricky, slippery grounds. Besides, the synthetic lining protects your feet from moisture, as well as from sweat. I like the supportive and comfortable 10-inch shaft, especially since these boots use the U-Turn Entry System for a fast pull-on. Still, they’re difficult to pull on the first few times, so expect there to be a break-in period. Their Advanced Torque Stability also guarantees you a supportive fit, minimizing any foot fatigue associated with prolonged walking, so these boots are definitely perfect for a jack of all trades. The composite forked shank contributes to increased support and decreased foot fatigue too, while the composite toe with its ASTM 2892-11 EH rating makes these boots great against electrical hazards. However, they might run somewhat narrow and feel a bit heavy, which is quite weird for composite-reinforced toe boots. The magic of Carhartt can easily be noticed with these boots, which are some of the best slip on work boots with a soft toe. So although their soft toe makes them non-safety, they’re still resistant to chemical hazards, as well as oily, slippery environments, with the advantage of being extremely comfortable and light. These boots are in the same price range with the Timberland boots. Still, their design and craftsmanship are well-worth their steep price because the mix of oil-tanned leather and Cordura for the upper is highly resistant and durable. The dual-density polyurethane sole is one of the best types of soles in terms of traction, and the direct-attach welt construction offers increased flexibility. I love the comfortable, cushiony Ortholite insoles that, along with their TPU heels, minimize foot fatigue. Their 0.75-inch platforms are great for absorbing shocks, while the 11-inch shaft won’t let any debris or water to get inside, just like the Timberland boots. However, your feet will have some troubles getting inside too, at least at first. Speaking of which, their waterproof membrane is an outstanding addition since it will leave your feet dry regardless of the weather. I also appreciate the wide, 17.5-inch boot opening, much larger than that of the Timberlands, but even with it, these boots might run somewhat narrow. These boots have a similar price range to the Wolverine Men’s Raider, and they’re on par when it comes to the very little ankle support they offer, considering they only have a 4-inch shaft. However, these have a soft toe while the Raiders offer a steel toe, meaning the Stanley shoes are lighter, albeit less protective. For such an affordable price, though, these shoes definitely boast some amazing qualities. They’re leather-made, so they’re really resistant to abrasions and punctures. The rubber soles are great for traction considering they’re resistant to oil and slippery surfaces. But the best thing about them is hands-down: their resistance to acid. These shoes offer good sole support thanks to their comfortable build, and the best is that you don’t need to break them in. However, the front and back pull-on loops might feel a bit narrow, especially if you’re a bigger guy. The rubber sole is quite flexible, just like the EVA footbed and midsole, and it also helps that the Stanley shoes are really light. And don’t forget that both the outsole and the midsole are polyurethane-injected for increased comfort. We’ve taken you through a series of some of the best-rated pull-on work boots on the market, so we hope you found a pair you love. But even if you didn’t, we hope our buying guide will help you make an informed final decision. But now, tell us what you think. Which of these boots do you love? Which would you never buy? 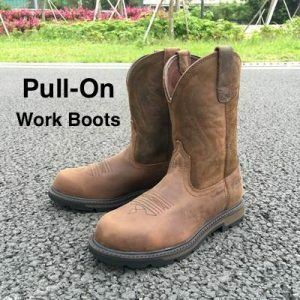 What work boots have you tried before? What’s your line of work? Let us know in the comments box below!